← “Aren’t You Hot in That? !” How Hair Wrapping Can Help You Beat the Heat! That is so beautiful. Thank you for mentioning what kind of scarfs are used. It would help if woman would mention the colors exactly also so if so inclined we can know what to order. Love the lace combo, so elegant. Naomi Rose, you have such a great sense of style. The entire team has great style, so different from each other, the personalities really shine. It’s inspiring. We spent Pesach at my parents’ house in Monsey. I keep my 2-in-1s in one big shopping bag, so I just brought that whole bag and added my dark gold shimmery and a couple of saris to coordinate with my Yom Tov outfits. It was easy, and I had what I needed. WOnderful advice,especially since I’m off to Israel in 2 weeks! Ina, we were in Israel at the same time. I wish I had seen this posting before I left. I don’t know how I missed it. I was in Israel the month of July. So, no Pashminas. 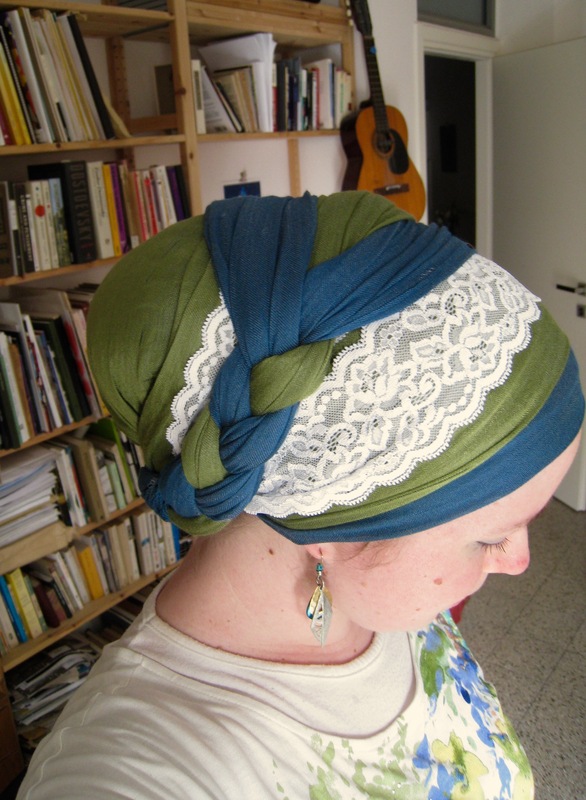 I brought several Israeli tichels since without the shaper, I can put a straw hat on. I guess in a way, instinctively, I packed in a similar fashion. Funny, but no problems with my hair clips in U.S., but in Israel leaving the country, I had to remove my tichel and my hair clip. I was in business class, so it was easier sleeping but without any shapers. Very helpful! Thx! I want your sari sash! I hope Wrapunzel will be restocking them soon? I like to stick to three colors plus denim (which goes with everything) and take mostly solid colors. 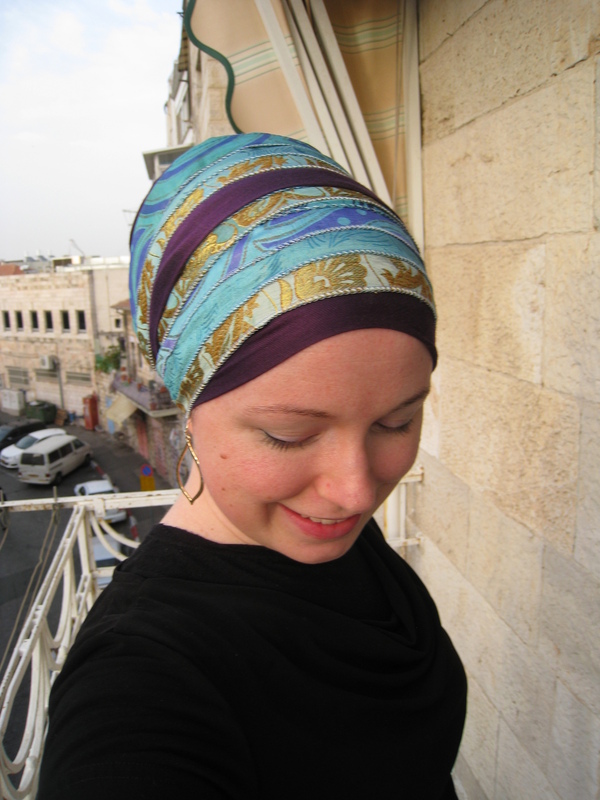 Unless I have an outfit planned that calls for a specific tichel, I make sure the patterned ones will go with at least two outfits. Then I roll them up and put them all into a gallon-sized ziplock baggie. The hard part for me is picking out the shoes to wear. 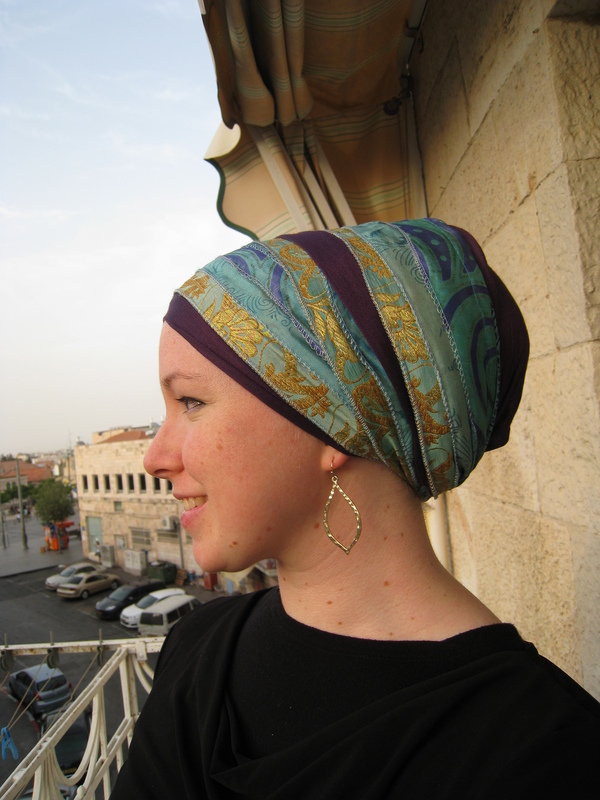 Question for the group : when you travel, what do you wear on your head, especially when flying. TSA can be a bit of a hassle (no complaints when they are doing their job properly) when it comes to head coverings. I fly wearing hats with no metal in them (it can be used in the brim to give it shape) and as little metal in my hair as possible. Even though I have TSA pre-check they can still stop you. I also find that if I have too much bulk in the back of my head the airline seat is even more uncomfortable to sit in. Thoughts. You’re so scientific! Love it! Regarding airplane seat I always French braid my hair underneath so that it’s all tucked away in the back but without creating a bun. I like to do a loose regal wrap with this which looks great from the front and just flat in the back but super comfy!